The EL2212 digital output terminal connects the binary control signals from the automation unit on to the actuators at the process level with electrical isolation. The EL2212 supports the particularly fast switching of inductive loads, such as valves. 24…72 V supplies are connected to the power contacts and passed through to the load when switched on. After an adjustable waiting period the terminal begins to control the current channel-wise in order to protect the load. The switching event is precisely positionable by time stamp. The switch-off process is also accelerated considerably by the pole reversal of the voltage. 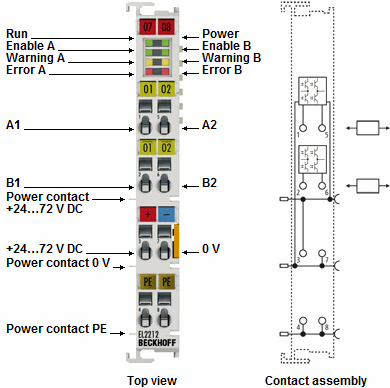 Special features Current-controlled outputs can be connected in high-resistance mode.